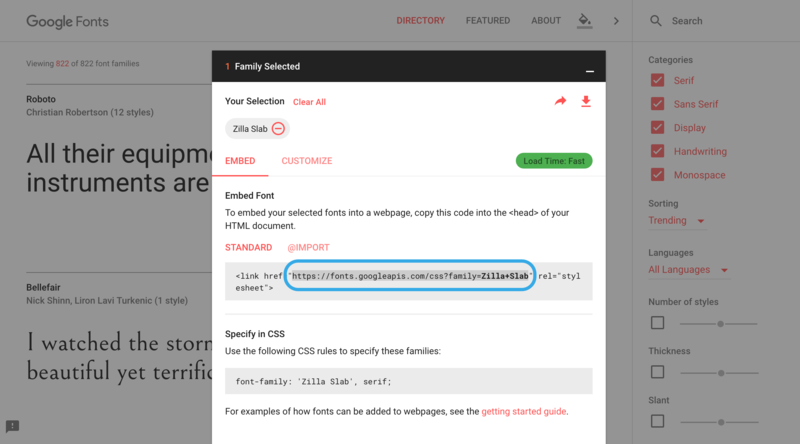 Navigate to the Google Fonts page and select the fonts you wish to include in your Appcues theme. 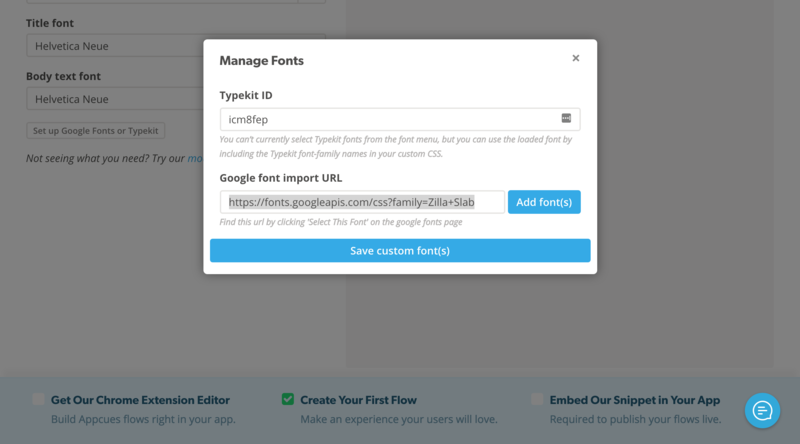 You can add any number of fonts by pressing the plus button, and they will appear in a drop-down at the bottom of the screen with the label 'Family/Families Selected'. Open up the 'Family/Families Selected' drop-down and copy the URL provided. 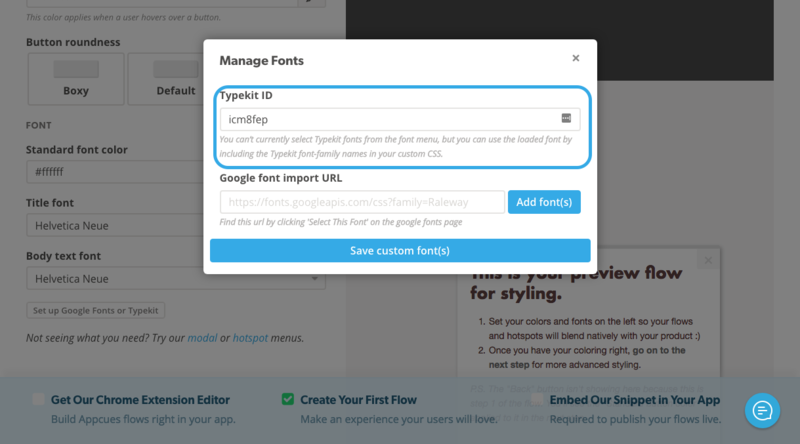 On the styling page, open up the Font Manager window by clicking 'Set up Google Fonts or Typekit'. Underneath the label 'Google font import URL' you will see an input field. 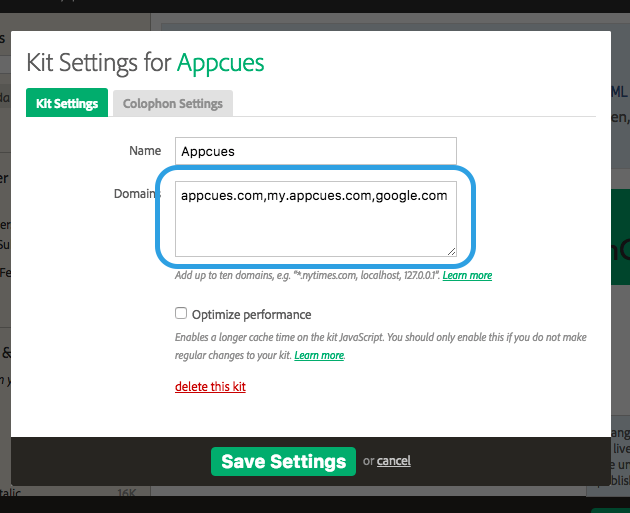 Paste your copied URL here and press the 'Add font(s)' button. You will see a preview of the fonts that will appear in the 'Title' and 'Body' drop-down menus. If these look correct, click 'Save custom font(s)'. 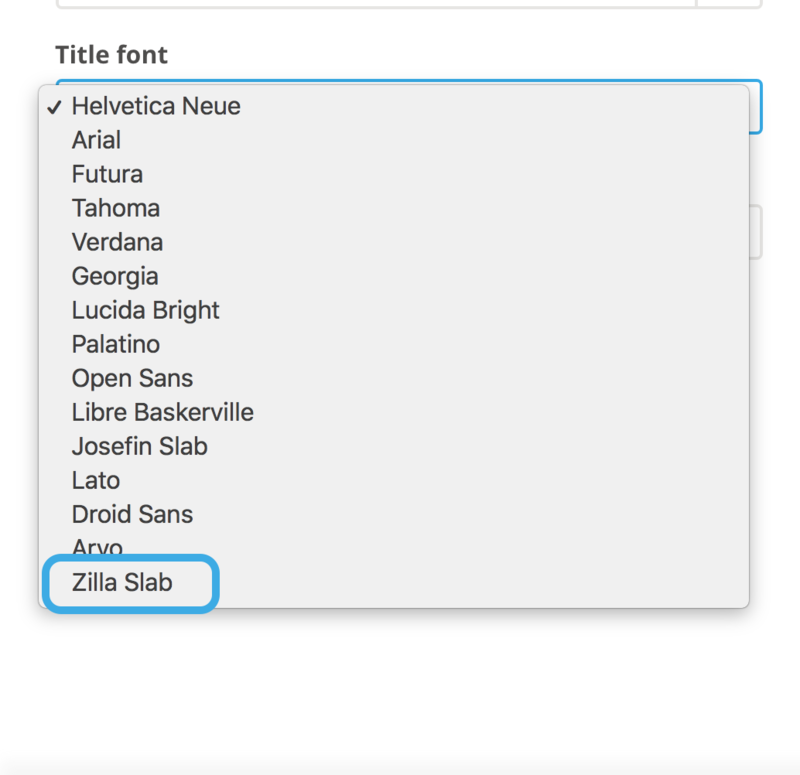 In the 'Title font' and 'Body font' drop-down menus, you will now be able to select the fonts you have added via Google Fonts. 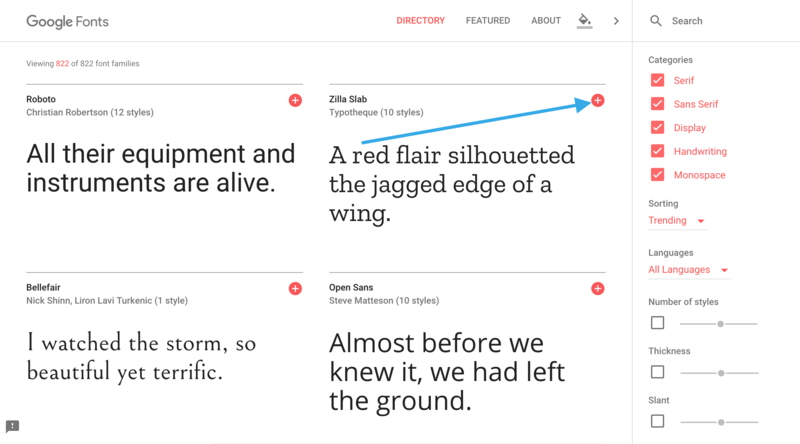 (Note: If you save a theme without selecting one of the google fonts from either drop-down menu, the google font will be removed from you styles altogether to improve performance and load time). 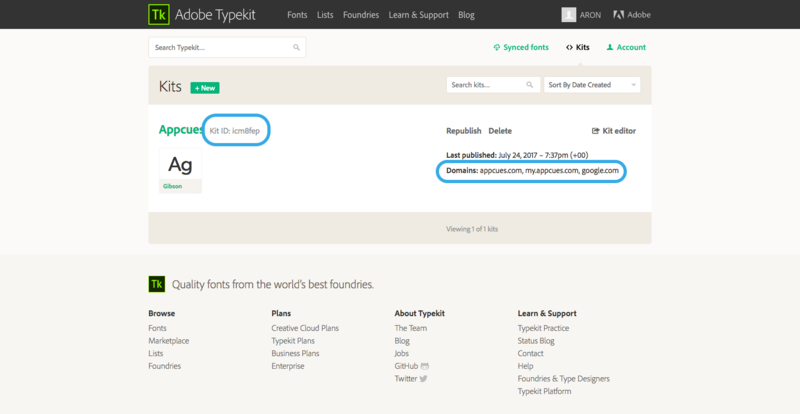 You can view your published kits on the Typekit dashboard. 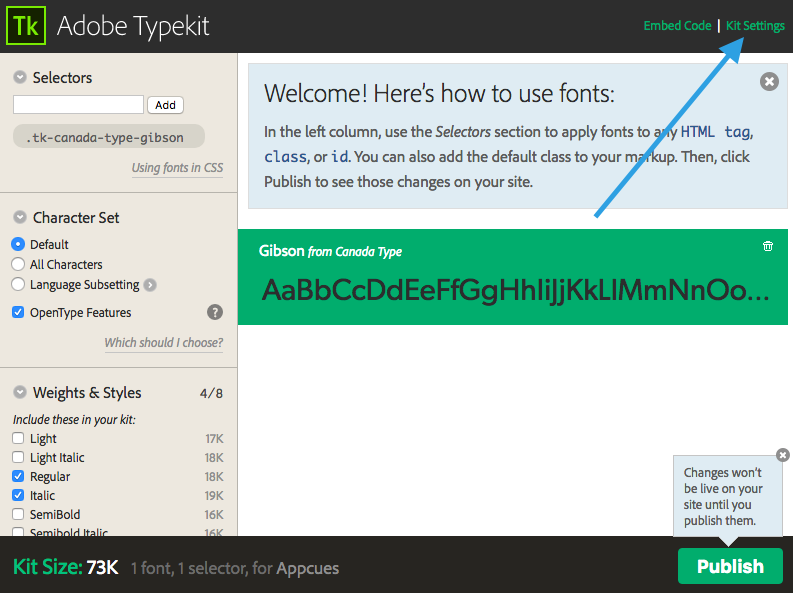 The only thing Appcues needs to utilize your published Typekit is the Kit ID. In order to use Typekit with Appcues, you will need to ensure that the kit is published and approved on all domains you wish to build Appcues flows on (as well as my.appcues.com if you wish to be able to preview the imported fonts on the styling page). You can add these values by clicking on the 'Kit editor' option for the kit you wish to include in Appcues. 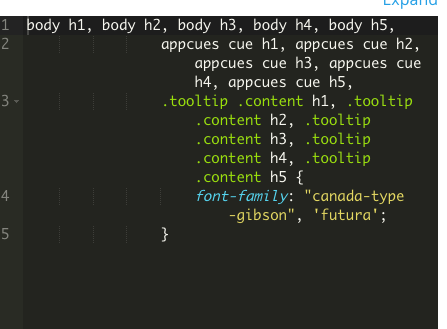 Now you can assign the included font-families to Appcues content using our CSS editor. If you have included my.appcues.com in your kit's list of domains, you will be able to instantly preview this font on the styling page. 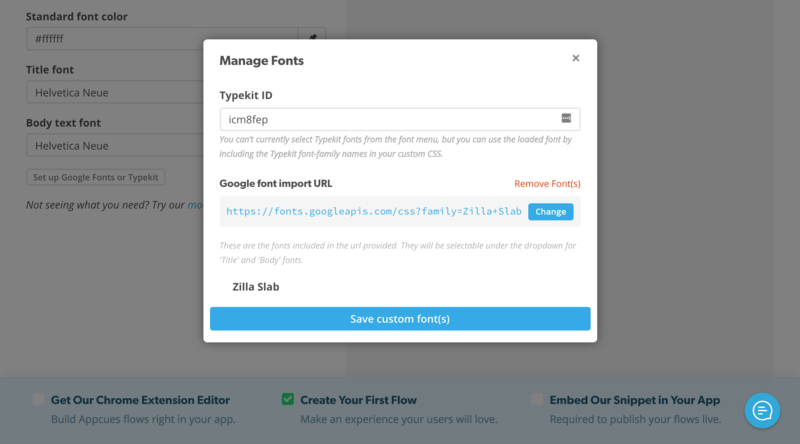 The CSS editor is a valuable resource to import fonts from self-hosted or third-party sources or apply fonts to particular items in your Appcues flows. This section will guide you through the process of importing and applying a custom font. Create an `import` declaration in your custom CSS linking to the font of your choice. For instance, if you wanted to import a font from a self-hosted S3 bucket you could do so like this. Alternatively, you could import a font file directly by using @font-face. Specify the elements you want to apply your new font-face to by specifying the name you gave the font-face ('Raleway' above) as the font-family for the elements in your custom CSS. You can apply the font to just your header elements like so. You should be able to see your font being used in the 'Interactive Preview' section. If we wanted to apply the font to all elements in your Appcues flows, you could do so using the * selector.